Binh Dinh (VNA) - A fishing boat has caught more than 1.1 tonnes of tuna off Quy Nhon city in the central province of Binh Dinh. The off-season catch was sold for 110,000 VND (4.84 USD) per kilogramme. Tran Quang Bao, captain of the boat, said tuna prices had increased by around 12,000 VND (53 cents) per kilogramme since last month. "The price is quite high and so fishing boats and their crews have high incomes. We are quickly stocking up on food and water to return to the sea." According to the provincial Department of Agriculture and Rural Development, so far this year the fishermen have caught 8,511 tonnes of tuna, up 18.6 percent compared to the same period last year. On average, a boat earns 70-80 million VND (3,077-3,517 USD) per trip. 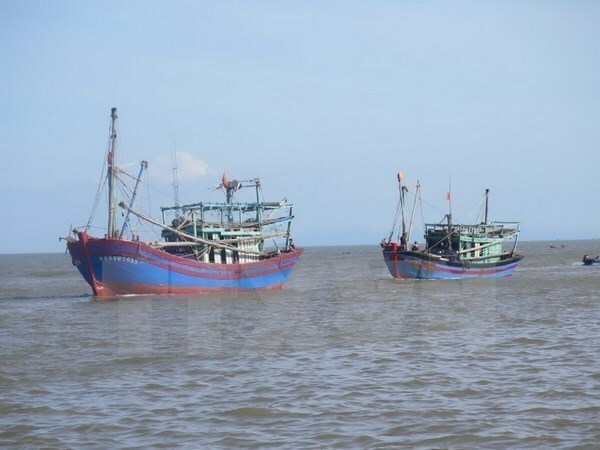 Nguyen Viet Nghia, deputy director of the Institute for Seafood Research, said 485,600-502,900 tonnes of tuna are caught off central provinces every year. The boats are mainly from Phu Yen, Khanh Hoa and Binh Dinh, and their catches comprise yellow fin tuna, big eye tuna and skipjack tuna, he said. Binh Dinh was the first province to use new technologies and skills to supply fish to Japan, especially tuna. By 2014 the province’s fishermen had modern equipment and technologies worth 1 million USD to catch, preserve and transport tuna. In September that year the first tuna was exported to Japan and sold at three times the price the fish fetches in the Vietnamese market.